When Dr Tith Hongyoeu opened Roomchang Dental and Aesthetic Hospital in a new 10-storey building on Street 184 just off Norodom Boulevard six months ago, it was the realisation of a dream come true for a poor boy from Kampong Thom province who grew up tending cows and cutting grass under the Khmer Rouge. What he’s most proud of is the fact that people no longer need to travel outside Cambodia to get top notch dental care. The American, Chinese, Japanese and Malaysian embassies have all acknowledged Roomchang as a safe place for their staff to get dental work done. Dr Tith recently signed a contract with the Peace Corps, a US government volunteer service, that enables the young American volunteers in Cambodia to get their dental work done at Roomchang. Among Dr Tith’s patients are the upper ranks of the Cambodian government, including Prime Minister Hun Sen himself. Dr Tith says he’s grateful to the Cambodian leadership for creating the conditions for economic stability following a difficult past. He calls on all young Cambodians from the rural areas or the cities to focus on education and to come up with their own dreams. “By passion they can make their dreams come true like me,” he said. Dr Tith said his success was the result of a personal strategy of learning new things each day and constantly striving himself to become better. He’s a crusader against laziness. He said learning is the key to success in life. “I have absorbed knowledge that I can utilise and transfer it into development in dentistry. I can learn from the construction worker, electricity from electrician, plumbing, so I can build a hospital. Within Roomchang, Dr Tith is proud of the latest technology, including a centralised suction and compressor system from Germany, dental chairs and X-ray machines from Italy and Japan, as well as a CAD/CAM system from the USA. With 21 dentists and a total of 80 staff members, Dr Tith says he takes pride in taking on the complicated cases personally. Revenue has increased 40 per cent since opening in December. Next year, 10 additional dental chairs will be added on the fourth floor. The investment in the latest imported dental equipment at Roomchang cost $2.5 million. Dr Tith says dental treatment at Roomchang costs about 20 per cent of what it costs in the United States or Australia, which puts Cambodia on the map for what he calls dental tourism. “One root canal in the United States costs about $1,000 and our fee is only $200,” he said. Dr Tith takes hygiene very seriously, with as many disposable products as possible: disposable gloves and single use materials. He uses the highest graded sterilization systems for the equipment including antiseptic solutions, ultrasonic cleaners, clean water washes and finally a “type B autoclave” which is the highest standard disinfectant procedure. The 75 foreigners per day who go through Roomchang are managed through appointments with about eight patients per dentist. Most foreigners are European along with Americans, Australians and citizens of the United Kingdom. “We welcome to all the tourists who plan to visit Cambodia to save money. For example if they spend $20,000 in their home country for dental work, they can have it done in Cambodia for $4,000. Interestingly, more foreigners have gum disease than Cambodians, which Dr Tith thinks comes from a combination of a diet with fewer vegetables and colder weather, which makes bathing less frequent. 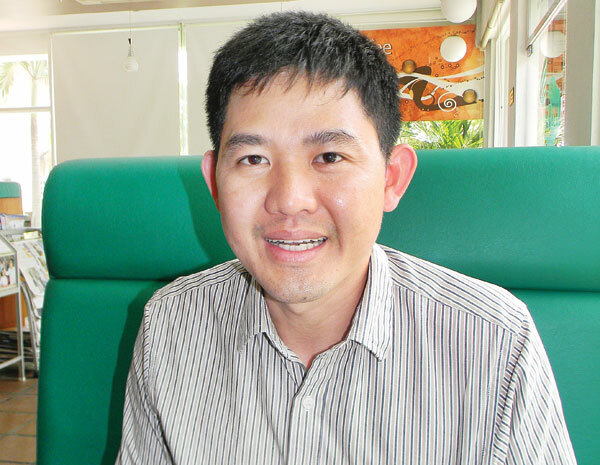 With a two-pronged approach, for Cambodians and foreigners, Dr Tith says some patents even with difficult dental problems might not need additional treatment for ten to twenty years. Dr Tith says for Cambodians who have never seen a dentist, he cleans the teeth, does the treatment that is required and tells them to brush after every meal. “I feel the public awareness in Cambodia is improving and people need better quality of life, a quality healthcare system and a quality education system. We guide people to improve their quality of life. We are the light for them. They know they have a good dental service,” he said. In Kampong Thom at the age of six, young Tith started working in the fields, tending cows and cutting grass. He finished high school in 1989 and went to dental school in Phnom Penh in 1990. “I found that standard of dental education and care was very low. I saw that I could transform this low standard to modern dental healthcare. In September, Dr Tith will return to Germany for another study program.